This guideline establishes criteria and requirements for the interconnection of distributed resources within the distribution system of EPCOR Distribution & Transmission Inc. (EDTI). Specifically, this guideline defines the technical requirements for connecting generation that is not exclusively owned by EDTI, but is connected to EDTI facilities, with an operating voltage of 25,000 volts (25 kV) or lower. Requirements relevant to the safety, performance, operation, testing and maintenance of the interconnection are provided. The Power Producer’s generation and interconnection installation must meet all applicable national, provincial and local construction and safety codes. Any Power Producer may operate 60 Hertz, three-phase or single-phase generating equipment, in parallel with EDTI’s System and in accordance with EDTI’s Interconnection Operating and Maintenance Agreement, provided the equipment and Power Producer meets or exceeds the requirements of this guideline. Distribution system’s technical requirements. The Power Producer’s equipment must be able to operate within the ranges specified in this section. Technical requirements to be met by the Power Producer. Technical requirements to be met by the facilities interconnecting the producing facility with the distribution system. These requirements promote safe operation and minimize the impact on electrical equipment within the EDTI System including other customers. These requirements do not address the protection for the Power Producer’s generation equipment. It is the responsibility of the Power Producer to provide such protection. The Power Producer is responsible for protecting the Power Producer’s generating equipment in such a manner that utility system outages, short circuits or other disturbances, including excessive zero sequence currents and ferroresonant overvoltages, do not damage the Power Producer’s generating equipment. As required in this guideline, the Power Producer’s protective equipment must also prevent excessive or unnecessary tripping that would affect EDTI’s reliability and power quality to other customers. The Power Producer is required to install, operate and maintain, in good order and repair and in conformity with good electrical practice, the facilities required by this guideline for safe parallel operation with EDTI’s distribution system. Each distribution circuit on EDTI’s distribution system is normally radial supplied from a single substation. EDTI’s distribution circuits operate at 4.16 kV, 13.8 kV or 25 kV nominal line-to-line voltages. Some areas of the downtown core of Edmonton are operated as a network system, with multiple paths for power to flow from an EPCOR substation to the customer. Reverse power flow from the customer back through the secondary network is not allowed. Refer to the requirement for reverse power protection (See 4.3.8). Three-phase primary voltage service is available on 13.8 kV and 25 kV circuits. The Alberta Interconnected Electric System (AIES) operates nominally at 60 Hertz (Hz) alternating current (AC). Frequency deviations are typically 59.7 Hz to 60.2 Hz for small contingencies that cause modest disturbances, when the AIES remains intact and connected to the Western System. For large contingencies, variations of 58 Hz to 61 Hz or greater can occur. These variations can be experienced when a portion of the AIES becomes islanded. CSA Standard CAN3-C235-83 Preferred Voltage Levels for AC Systems 0 to 50 000 V, provides general guidance for appropriate performance. All interconnected equipment must comply with EDTI’s standards for power quality. The following industry standards provide guidance for appropriate performance. According to the IEEE 519 standard, the recommended practice for utilities is to limit the maximum individual frequency voltage harmonics to 3% of the fundamental frequency and the voltage total harmonic distortion (THD) to 5% on the utility side of the Point of Common Coupling (PCC). These harmonic voltage limits can be used as system design values for the “worst case” under normal operation. Fault levels, including maximum allowable fault levels, vary significantly throughout a distribution system. These must be considered in the design of the interconnection. Fault levels and X/R ratios must be evaluated for the equipment selected. The Power Producer’s facility must not increase fault levels on EPCOR’s distribution or transmission system above each system’s design levels for maximum faults (See 4.3.11). Distribution facilities are typically operated as effectively (solidly) grounded and wye-connected at the source substation bus. Distribution facility grounding must conform to the Alberta Electrical and Communication Utility Code (formerly the Alberta Electrical and Communication Utility System Regulation 44/1976 or future amendments). To maintain the reliability of the distribution system, EDTI typically uses automatic reclosing. The Power Producer needs to take into consideration line reclosing when designing generator protection schemes. This is to ensure that the generator is disconnected from EDTI’s distribution system prior to the automatic reclose of breakers. The Power Producer may reconnect when EDTI’s system voltage and frequency return to the normal range and is stabilized. Title: Technical Guideline For Interconnection Of Generators To The Distribution System – EPCOR DISTRIBUTION & TRANSMISSION INC. (EDTI). 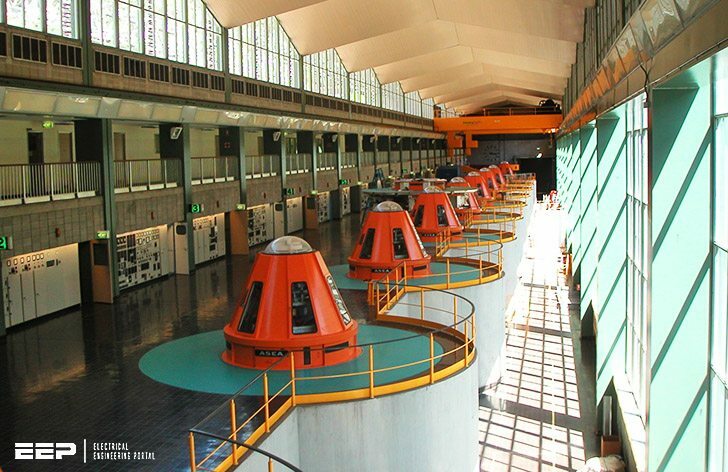 Strange to use a pic of Murray 1 hydro station (in Australia) which at 950 MW is three times bigger than the largest Alberta hydro station. Snowy Hydro operates at 50Hz and connects to transmission only.